Product Type : Pink 6 Non-Removable jewelry Pouch. Lightweight,portable and fashionable jewelry, makeup bag use for travel,luggage,wardrobe organizer, mess kit. Large Capacity ensure you can store more, don’t need to worry about you have to leave some of your cosmetics at home and can store all your Payal, Watch, Chain, Bracelet Bindi,Necklace,Earnings,Rings,etc…in different pouch so it cannot be mesh with each other. This makeup bag is design to simplify your life.You just need to put all your cosmetic accessories into this bag,and that’s it,simple and easy,foolproof. It can be used as a cosmetic bag in which you can store lipsticks,nail paints,makeup brush,nail remover,eyeliner,lip liner,kajal,mascara and travel kit-you can really make your package yours.Use it your way! 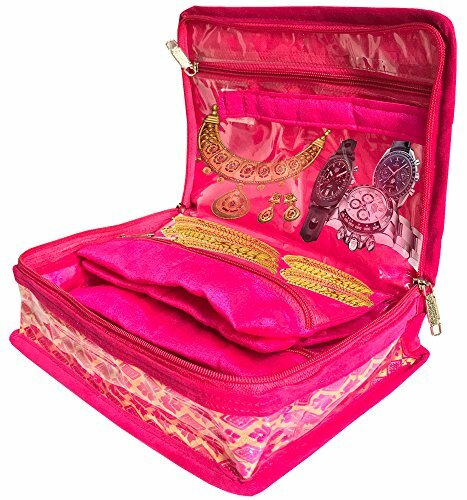 This Brocade Jewelry Make Up Storage Organizer can be Gift Prevent your favorite costly cosmetic and jewelry from dust and moisture, 4 Pouches With Various Sections like Lipstick,Clutches etc.,Exclusive Product With Superior Quality. Wedding Collection Gift. Warranty : 30 days warranty By Sepal. IF you like our product please review it. 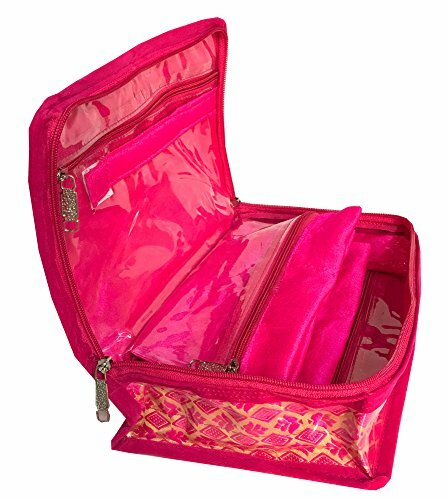 MULTIPLE COMPARTMENTS: 6 Non-Removable zippered Pouch 2 zipper compartments and one inner recrone strip will hold your earrings, necklaces, chains, rings, pendants, bracelets, bindi, bangles and more with ease. Keeps your jewelry separated, preventing tangles all while still allowing easy access. An interior zipper pockets will hold anything you need. CONVENIENT FOR YOUR MESSY MAKEUP OR SMALL ITEMS : You Do Not Have To Hunt For Your Cosmetics in a Messy Bag, See All Your Cosmetics at Once,When You Can Not Find Something You Want,And Then Pack It Up. Laminated and cushioned from all the sides to protect your jewellery and accessories from breakage, dust, dirt & moisture. It’s a best option to use while travelling and it will help you to keep your heavy jewellery in a separate cover from other items in your luggage. Jewellery Organizer to organize and store your jewellery, watches, accessories in one pouch with separate pockets. It protects your accessories from getting damaged and scratches.